12 Day of Christmas Gift Ideas - Easy & Fun Ideas for Kids Too! How to Celebrate 12 Days of Christmas: With Easy Ideas! 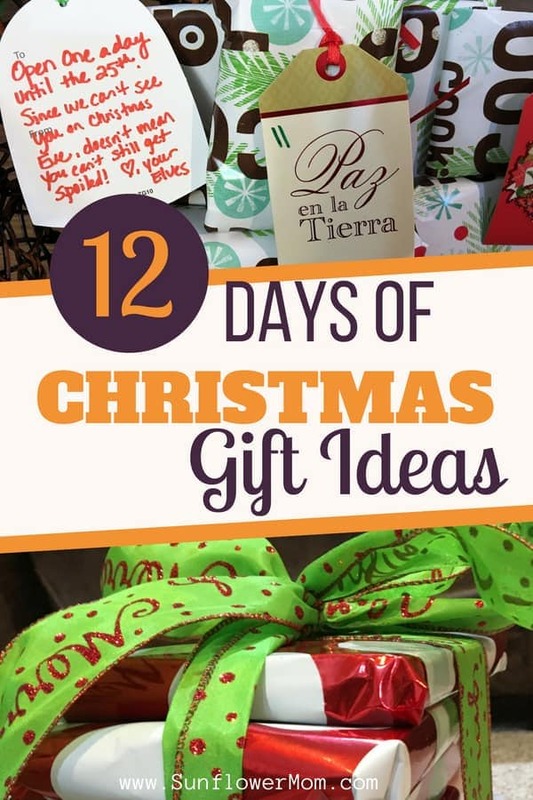 Below: 12 days of Christmas gift ideas for family, friends, and teachers. Giving the 12 days of Christmas gifts with your kids can be the highlight of your holiday. Here are some fabulous ideas. This post contains affiliate links. As a single parent, I know first hand it’s often not the holiday itself that can be lonely but the whole season can bring on loneliness. A few years ago, I watched my neighbor, a single father in his 60s care tirelessly for his aging parents and grown children, and I wondered what my children and I could do to make his whole December a bit brighter. And maybe take my mind off my problems at the same time. What we found not only brought him joy but started our family’s favorite tradition. Giving 12 days of Christmas gifts to a variety of unsuspecting (but always deserving) family and friends is hands down the most fulfilling part of my Christmas. And my children’s. Each season my children and I choose a handful of people to give 12 Days of Christmas gifts the days leading up to Christmas. The way in which we present the gifts is always different. Depending on who they are it may be anonymous, or they may know who we are. Below are some different ideas to give the 12 Days of Christmas that has worked for us over the years. There are many 12 Days of Christmas gift ideas. Below are just a few that we have done over the years and have had great success with. In the end, the most important thing is the joy that is given and received. This is a fun way to start your tradition. Many of these you can buy from a discount store like Dollar General. Buying gifts from the theme song can be easy for you, fun for the kids, and the recipient has a ball getting all the gifts. You don’t need to print out a rhyming poem because everyone knows the song, but if you want to be cutesy, print out this poem I pieced together. It has other ideas on what to buy for each stanza of the song if you don’t like the ideas above. 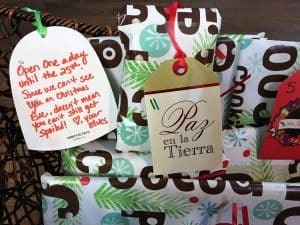 Our first year of giving the 12 Days of Christmas gifts, we gave gifts relating to the famous song to our next-door neighbor. Giving this gift worked out great for my young children. Our recipient lived next door, so I didn’t worry about them going outside in the dark. I’m pretty sure our neighbor knew who the “secret elf” was but my children loved thinking they were super sly. 2. Buy ornaments matching the days. Give one ornament for each day of the song. Hallmark or Amazon has some cute options like these ornaments matching up to each stanza of the official song. You can wrap one up for each day leading up to Christmas and surprise your friend each day. You can start with one of something they need for the classroom then work your way up to 12 dry-erase markers, for example. Most teachers have a wish list of items they want for their class. It’s also fun to sneak in a $10 gift card to Starbucks or Sonic for Day 10. Here are some ideas, but swap out whatever makes sense. One approach is to buy extra at the beginning of the school year when the school lists come out and hold on to it for a couple of months. I collect small items throughout the year for people I plan to bless during December. Hands down, our favorite recipient would have to be my kids’ Great-grandma. All year long we think about what would make her smile. You don’t need a corny poem coinciding with the famous song. Wrap them up and put a 2 on one present and give it on the 2nd day. By the 4th day, your recipient will know what’s going on. Related: Regifting can save you money and brighten someone’s day. Here’s how to make it a win-win. Twelve gifts can also mean one for each month next year. For example, give your loved one 12 books marked January through February. Or 12 Bible devotions. For more ideas, check out how to give homemade subscription boxes. Also, grab your free labels while you’re there. For my Grandmother, we drive one to her house each night after it gets dark. The first year we did this she had no idea. My Grandmother later told me she asked neighbors and other family members if they saw anything. On Christmas Eve my children rang the bell and waited for her to come to the door. Her face of shock and disbelief said it all. She said it was the sweetest thing anyone had ever done for her in her 80 years. For my children’s teachers, we count out how many school days before 12 days remain before Christmas break and bring gifts to school this way. The kids last about two days before they have to tell the teacher it’s them. 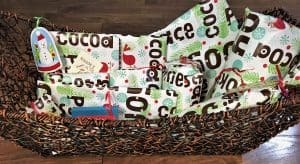 If you have a family member far away you would like to do this for, you can send them all 12 gifts at once and number the gifts with instructions on which to open when. Sometimes we drop off all the presents at once and put a tag numbered 1-12 on all of them. Things get a little messy around our house during December while we prepare for the 12 days of Christmas. 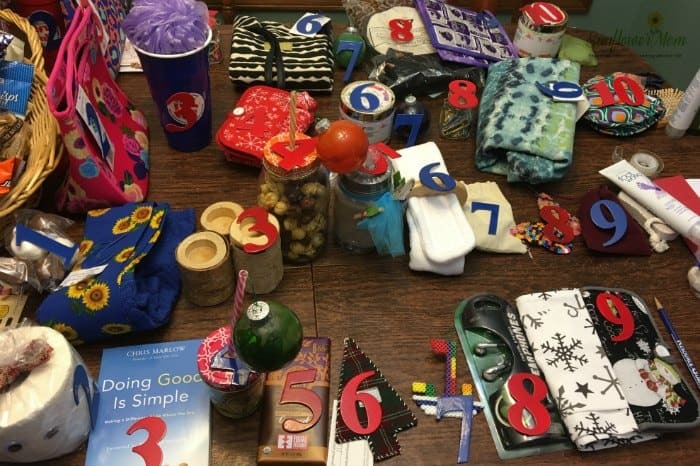 Our table overflows with gifts numbered 1-12 for the teachers so the kids can pick one up on the way out the door. We’ve been doing this for so long, it’s not a secret anymore to our recipients. But the kids still love it so we all keep it up. What started 5 years ago as a small project to put a smile on my neighbor’s face, ended up as a tradition to brighten the month of December for many. It’s filled my Christmas’ with more meaning. I pray it’s a tradition my children will continue when they have children. I challenge you to use the above 12 days of Christmas gift ideas for one person who could use a lift this Christmas season. Involve your kids. I have found celebrating others blesses you. 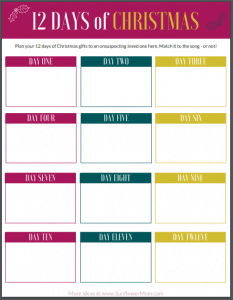 Use 12 Days of Christmas worksheet from the resource library to plan out your gifts and how you will deliver them. Organization and delivery are key. Previous Post: « Monthly Subscription Gifts – Your Guide to Making Your Own!